“Tee it high and let it fly,” was the motto of the late Chuck Gates, who loved the game of golf and smacking the ball a country mile. 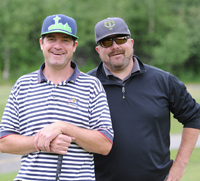 It’s what 20 foursomes did on Father’s Day, Sunday, June 15 at Sun Valley Golf Course where the 17th annual Chuck Gates Memorial golf tournament was staged to raise money for junior golf and other causes. This year’s low gross winners in the Chuck Flight by six strokes with a score of 54 were Gardiner Young, Matt Meador, Kevin Cincotta and David Demkovich. Net winners in the Chuck Flight at 58 were Tom Ferries, Mike Neary, Mark Osmer and Shawn Aicher. Repeating as Gates Flight winners with net 59 in the best-ball scramble format were Bill Gehrke, John Reinholt, Paul Spitzer and Marcia Rankin. Longest drive winners were Ryan Mayer and Jen Harper. Closest-to-the-pin winners were Jack Bariteau, Tony Fiel, Kimberly Ellwanger and Jill Brennan. This year’s tourney was dedicated to Chuck Gates supporter Mark “Sparky” Anderson, former chef at Warm Springs Restaurant and Knob Hill Inn. Sparky’s family attended the tournament on the same weekend as a local memorial service held here for Anderson. Previous Gates tournaments were dedicated to Bill Butterfield in 2005, Bob Doyle in 2008, Mary Lou Simpson in 2009, Doyle Corbett in 2010, Tim Appleton in 2011, Woody Stuart in 2012 and Rafer Lutz in 2013. Fittingly, Sparky’s father Ward Anderson won the raffle grand prize of a Titleist Vokey wedge set valued at $500. Terry Fowler earned the raffle’s second grand prize is an Odyssey Tank putter valued at $250. Roland said that Sunday’s tournament raised $5,000. The committee decided to donate $3,000 to the Atkinson Park junior golf program, $2,000 to the Sun Valley Ski Education Foundation and $1,000 to the AquaAbility program. This year’s event at Sun Valley included for the fifth year the free Chuck Gates Junior Putting Contest at Sun Valley Golf Course. A portion of tournament proceeds also support the 11th annual Chuck Gates Junior golf tournament Friday, June 27 at Bigwood Golf Course. Chuck Gates Youth Golf Endowment board president Roger Roland of Ketchum has announced the receipt of another $10,000 grant from the Dwight Stuart Youth Fund (DSYF). Since 2010, DSYF has been a grant-making arm of the San Francisco-based Stuart Foundation. Originally established as an independent foundation in 2001, the fund was endowed by Dwight L. Stuart, Sr. (1924-1998) to benefit and serve the needs of children and youth in the greater Los Angeles area. Stuart was raised in the Pacific Northwest and lived for many years in Los Angeles. He was president of the Carnation Company from 1973-1983 and was the grandson of its founder, E.A. Stuart. A life-long supporter of youth mentoring and sports programs, Dwight Stuart was also a board advisor of the Stuart Foundation, which focuses on youth development, foster care, and K-12 educational issues. The Board of Advisors of DSYF is composed of Stuart's four sons and his sister. The Gates tournament was dedicated in 2012 to Woody Stuart, a son of Dwight Stuart. During the history of the tournament, the Dwight Stuart Youth Fund has given between $65,000 and $70,000 to the Chuck Gates Youth Endowment, Roland said. “It has been our biggest benefactor,” he said. 1st gross (54)—Gardiner Young, Matt Meador, Kevin Cincotta, David Demkovich. 2nd gross (60)—Jack Bariteau, Steve Myers, John Majors, Chip Stanek. 1st net (58)—Tom Ferries, Mike Neary, Mark Osmer, Shawn Aicher. 2nd net (58)—Jeff Petersen, Tyler Petersen, John Radford, John Radford Jr.
3rd net (59)—Roger Roland, Gary Moser, Dave Penn, Mike Pirzynski. 4th net (62)—Jolie Dunn, Kitty Willard, Jennifer Harper, Happy Hawn. 62—Kimberly Ellwanger, Howard Cain, John Manocheo, Renie Alverson. 62—Mark Belanger, Dave Klemer, Cooper Minnis, Ryan Mayer. 62—Scott Mary, Brock Mary, Mike Prohorenko, Tony Fiel. 64—Roger Wilson, Dallas Hall, Tate Berry, Julio Chavez. 1st net (59)—Bill Gehrke, John Reinholt, Paul Spitzer, Marcia Rankin. 2nd net (60)—John Kearney Sr., John Kearney Jr., Emma Wilander, Haley Cutler. 3rd net (60)—Janet Appleton, Glenn Thomas, Judy Locke, Spencer Vanguilden. 4th net (60)—James Young, Derek Holladay, Brian Bourgette, Rob Cronin. 61—Phil Doerflein, Ann Doerflein, Jim McElveen, Jill Brennan. 62—Bob Dunn, John Burke, Ward Anderson, Sean Barovetto. 63—Jackie Damerel, Doug D’Andrea, Janet Bostwick, Pete Bostwick. 63—Jim Gorringe, D.J. Hart, Ken Hills, Andrew Broderson. 63—Mark Watson, John Kaiser, Will Duval, Matt Curci. 65—Terry Fowler, Jerry Ross, Jim Vila, Joe Vila.